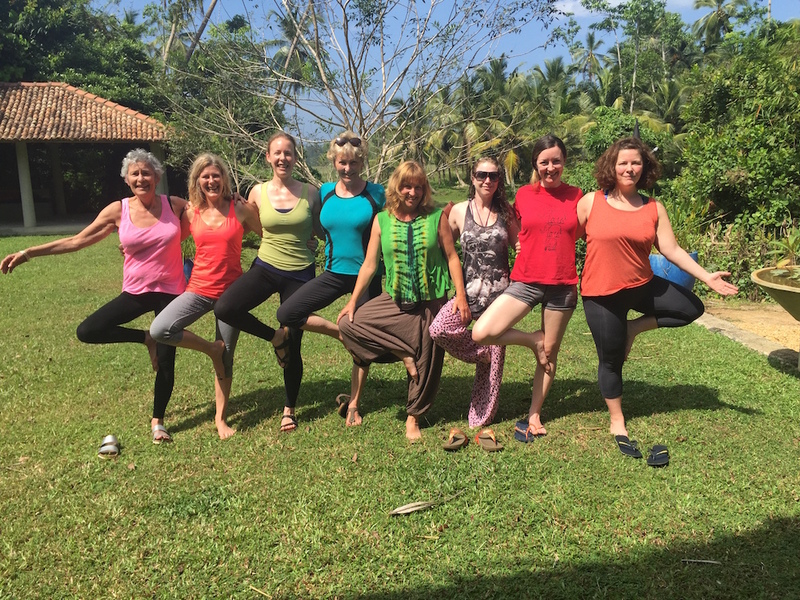 Come and join myself and my dear friend Carol Macarthney for some nourishing yoga and meditation, sun filled adventure in Sri Lanka. Immerse yourself deeply and open up to new possibilities through your breath, body and spirit. The luxurious and spacious Sri Devi Villa's is a 15 minutes walk inland from the turquoise blue sea on the southern coast of Sri Lanka. 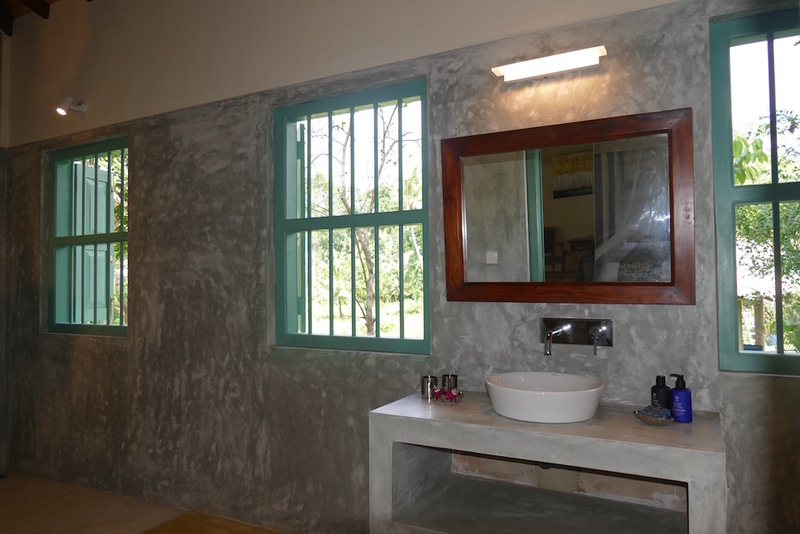 Situated 15 minutes ride from the city Galle. The retreat is overlooking the paddy fields filled with incredible beauty and an abundance of wildlife. Although the villa covers a huge area it is quite hidden away and really is the perfect place for complete relaxation submerging yourself to the array of nature and wildlife sounds and the chanting of monks in the far distance. Carol and myself will teach two yoga sessions a day, including yoga, pranayama, mindfulness and meditation. The mornings will begin with meditation and pranayama for those early risers, followed by a dynamic yet meditative hatha flow yoga practice. 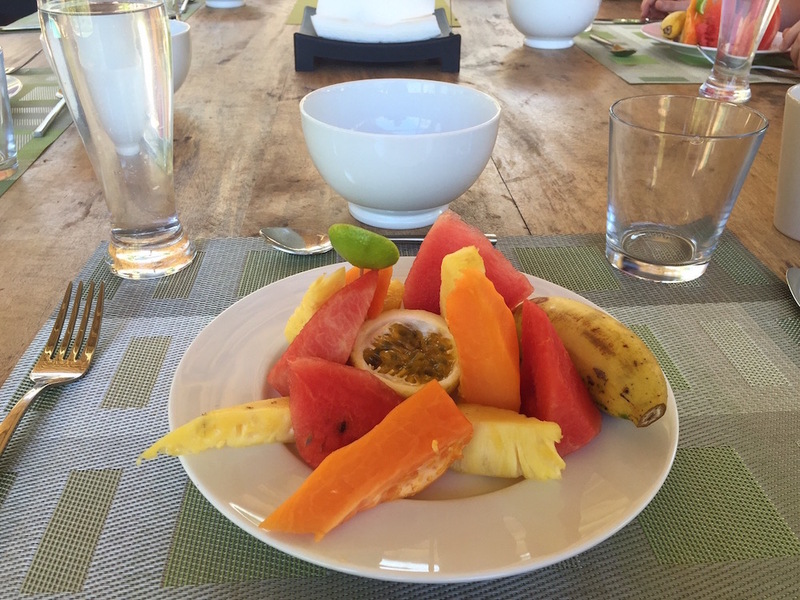 After the morning session, there is an abundance of fruits, a healthy and filling breakfast. There will be several hours in the day to please yourself, whether it be to walk to the nearby white sandy beaches, have a treatment from our in house ayuvedic masseuse, take a ride into the nearby shops, cafes and restaurants on the beach or simply chill by the pool. We will meet again in the late afternoon for a more gentler practice dedicated to nourishing yourself, including restorative postures, meditation, visualisations and yoga nidra. 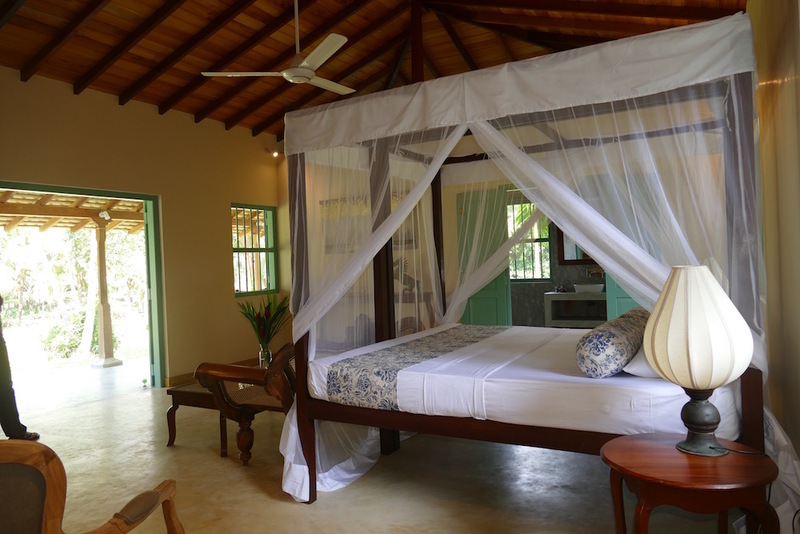 The villa is very luxurious and spacious, tucked away near a village and surrounded by wildlife. There are many different areas to have time to yourself undisturbed to simply relax. It is about a 15 minute walk along the paddy fields or 5 minute tuk-tuk (the local 3 wheeler) to the ocean and sandy beach. There are several beaches to choose from, some lively with music and entertainment, some quieter and expansive. Very varied with many restaurants along the coastline for stunning sunsets and entertainment if you wish to experience Sri Lanka's social life. There are several beaches to choose from, some lively with music and entertainment, some quieter and expansive. Very varied with many restaurants along the coastline for stunning sunsets and entertainment if you wish to experience Sri Lanka’s social life. The main beach and tourist centre of Unawatunas is very busy and offers numerous bars and restaurants. Near the beach is the small Buddhist temple “Wella Devale”, from which you can enjoy a beautiful view over the beach. Galle Beach is located next to the old town of Galle, where the well-preserved colonial fortress Galle Fort is located. Here you will find museums, shops and cafes. Yala : safari to see the wild elephants in Yala National Park. Kataragama, pilgrimage town in Sri Lanka for Buddhists, Hindus, Muslims and Veddas. Situated on the southern coast of Sri Lanka, offering excellent beaches for relaxing and enjoying unforgettable sunsets. There are a few tea plantations and various Buddhist temples along the coast. 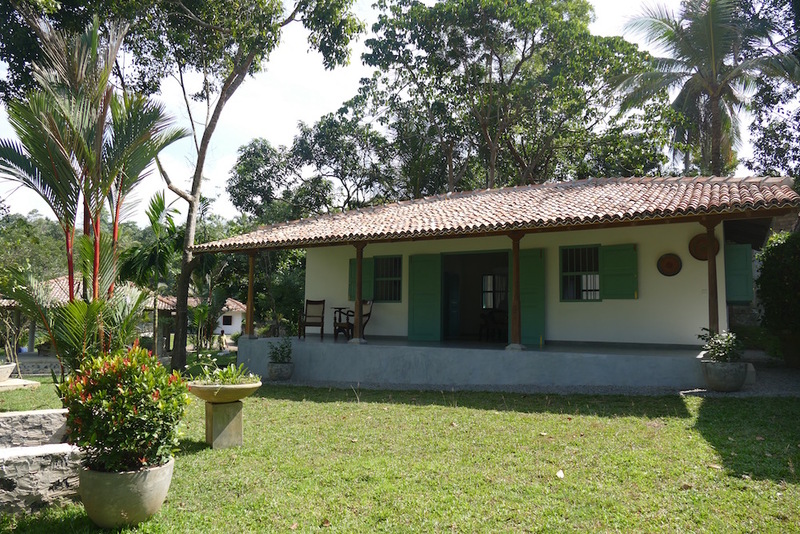 This luxury retreat centre has over 2.5 acres of tropical garden. The yoga platform is a covered outdoor space, situated next to the paddy fields in amongst the wildlife. There is a large pool, a spa and both an indoor and an outdoor covered lounging area. The centre is fully staffed who are extremely friendly and helpful and has all modern facilities. Rusindu, the chef is very creative with more than 15 years of experience in 5-star hotels in Dubai. In Sri Devi Retreat Rusindu cooks amazing locally inspired dishes using nothing but locally sourced products. Guests, who want to join Rusindu on his daily trips to the local vegetable and fish markets, are more than welcome. He’ll show you fruits and vegetables, which most guests have never seen before, and will show you afterwards how to prepare them. Salads made with snake gourd, gotukola or mukunuwenna. A light curry with jack fruit. General cooking techniques of the Sri Lankan cuisine : curries, fish and poultry in banana leaves, sambals and a few more secrets. There are many excursions on offer during the week and trips to explore on your day off. 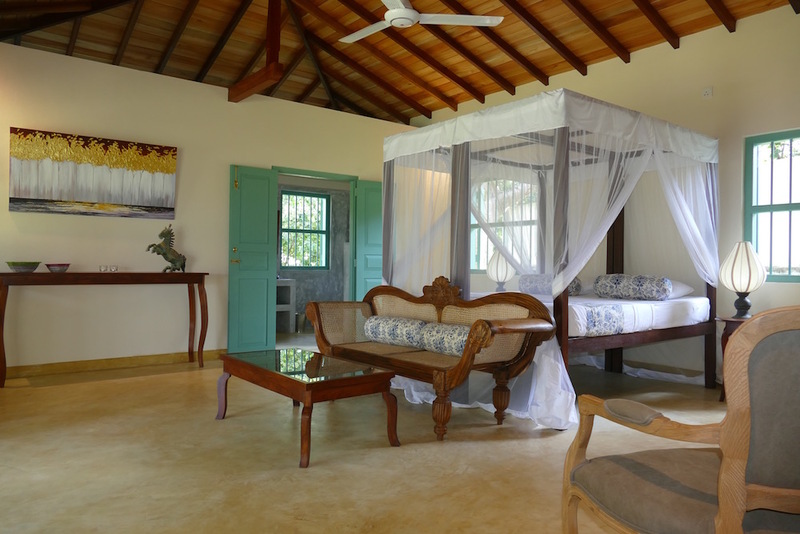 Sri Devi Villas has several villa's and offer clean and spacious twin beds in each. Each villa has its own tea/coffee making facility, a fridge and bar/counter with sink and a large private terrace/balcony and a large bathroom. In addition there is a fully equipped and staffed kitchen, and for no additional cost the staff can prepare your own food for you. There is a limited single occupancy available for an additional cost. In the spa we can offer ayurvedic floral / herbal baths, the shirodhara drip and a wide variety of massages. There is also the use of the stream box. An Ayurvedic diagnosis are available with one of the best practitioners and Umesha, our Ayurvedic therapist, has over 10 years of experience in different kinds of Ayurvedic massages and treatments. She worked for almost 10 years in the Paragon hotel, one of the best Ayurvedic hotel-clinics in Sri Lanka, and worked afterwards for a private Ayurvedic clinic before joining Sri Devi Retreat. Her specialties are chakra massages, shirodhara ( the slow oil stream on your forehead ) and relaxing body massages, reducing tension and stress.In house ayuvedic masseuse in the comfort of your own room. To reserve your place a non-refundable booking deposit of £400 is required. The full amount is due 6 weeks before the start of the retreat. If you haven't seen this part of Sri Lanka before then you may like to extend your stay. Sri Devi retreat offers accommodation either side of your retreat and options to hire a driver to show you around. There are also several affordable places in the area I can help you with. Advice and support for travel will be given by booking but flights are usually reasonably priced.